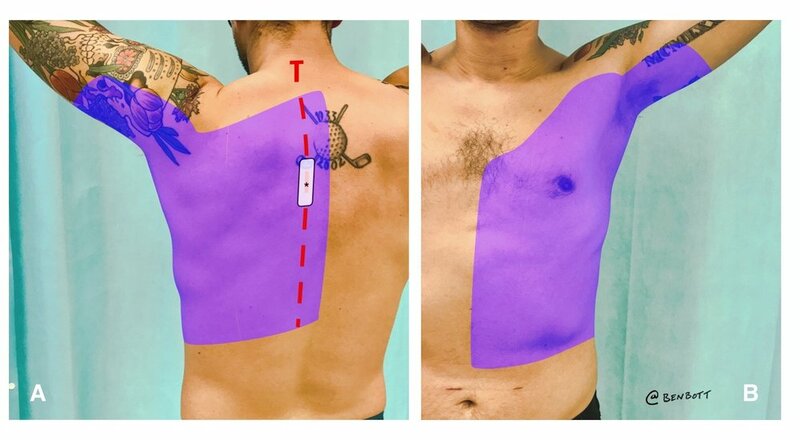 A truncal inter-fascial plane block with improved safety versus traditional epidural, paravertebral and intercostal blocks; and improved posterior anesthesia versus serratus anterior block. This block uses a single injection in the erector spinae plane (ESP) to anesthetize multiple vertebral levels of spinal nerves where they branch into dorsal and ventral rami. An ultrasound probe is placed on the back in cephalocaudal orientation approximately 3cm from midline at the desired vertebral level and the thoracic vertebral transverse process (TP) is identified on ultrasound. A block needle directed via in-plane ultrasound guidance to the posterior surface of the TP. This places the needle tip in the cephalocaudal-oriented ESP which lies between the erector spinae muscles (superficial) and the TPs (deep). After test aspirations and test injections, approximately 30 mL of LA is slowly injected in the ESP, distending the ESP and lifting the erector spinae muscles off the transverse processes as in the clip below. 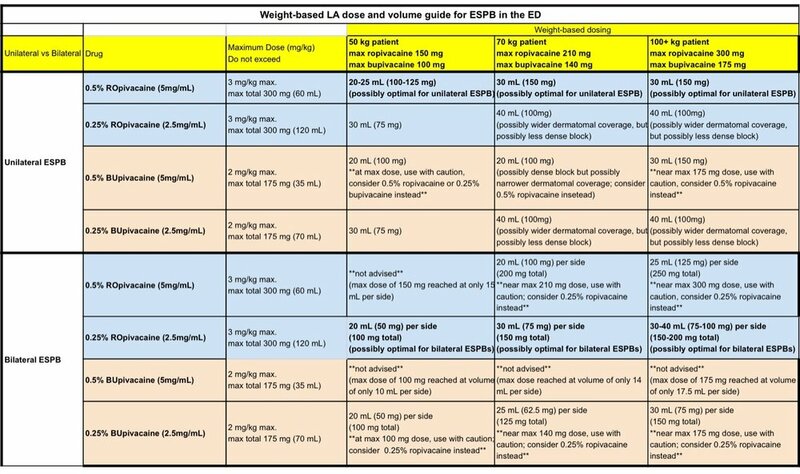 The ESP acts as a “leaky gutter” when injected with LA. View of the posterior thorax with tissues posterior to the TPs dissected away. The block needle is shown with the tip adjacent to the 5th thoracic TP. Cephalocaudal spread in the channel-like ESP extends anesthesia at least 3 vertebral levels above and 4 vertebral levels below the injection point allowing for extensive thoracic anesthesia from a single injection. T2, T5 and T9 = left transverse processes of the 2nd, 5th, and 9th thoracic vertebrae, respectively. Dark blue = T2 through T9 level cephalocaudal spread of LA with injection at T5 level TP. Figure 1B Local anesthetic spread with ESPB. Cross section of posterior thorax at the level of the 5th thoracic vertebrae. The block needle is shown injecting local anesthetic (LA) into the erector spinae fascial plane (ESP), which lies in the chest wall between the anterior surface of the cephalocaudal-oriented erector spinae muscles and the posterior surface of the spinal transverse processes. LA spread in the ESP anesthetizes the dorsal rami as they traverse this plane, providing anesthesia to the adjacent injured muscle and soft tissues that contribute to posterior rib fracture pain. Additionally, LA injected into the ESP spreads anterior, anesthetizing the ventral rami where they become intercostal nerves. This intercostal nerve anesthesia provides analgesia directly to the fractured ribs and periosteum, and to the lateral and anterior chest wall via the lateral and anterior branches of the intercostal nerves. DR = dorsal ramus, VR = ventral ramus, IC = intercostal nerve, dark blue shaded area = LA within the ESP, light blue shaded area = anterior LA spread to the IC and VR, LB = lateral branch of the DR, MB = medial branch of the DR, TP = transverse process, SP = spinous process, Tr = trapezius muscle, ES = erector spinae muscle, Rh = rhomboid muscle, Sc = subcutaneous tissue. 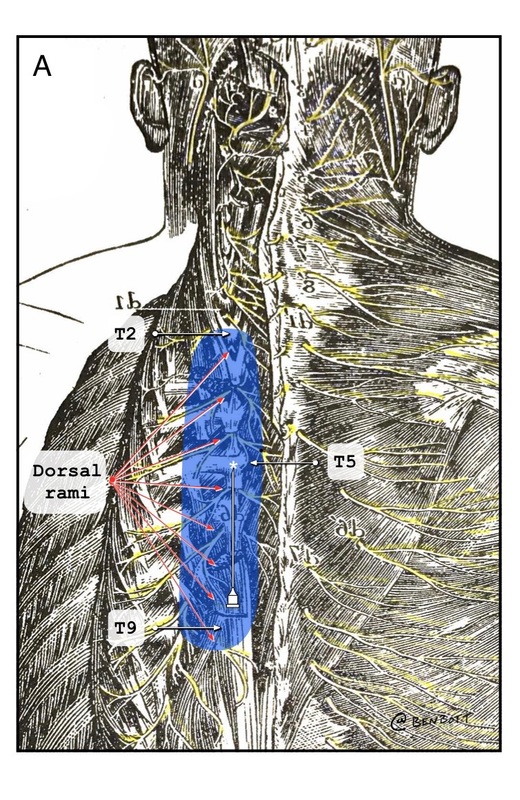 safety - needle path is in chest wall, outside thoracic cage, and away from pleura, spinal cord, and deep vessels. The needletip is visible throughout procedure. The broad transverse processes shield deeper structures. surgical-grade anesthesia of lateral or anterior thorax/abominal wall (i.e. using as sole anethetic for painful chest/abd wall procedures such as abscess drainage). It provides analgesia in this region, but unlikely surgical grade anesthesia. Expose the posterior thorax by placing the patient prone, in lateral decubitus, or leaning forward in a seated position. For the prone position, stand at the head of the bed with the ultrasound system on either side of the bed at the level of the patient's thighs. For the lateral decubitus position (with patient lying on their unaffected side), sit at the side of the bed facing the patient's back with the ultrasound system on the opposite side of the bed (anterior to the patient). For the seated position, seat the patient on the edge of the bed leaning forward onto a side table in a position similar to the seated lumbar puncture position. Stand behind the patient with the ultrasound system located on the opposite side of the bed anterior to the patient. For all positions, elevate the bed to a level where the needle, probe, and ultrasound screen can all be viewed in direct line-of-site with minimal head movement. The substantial LA spread associated with this block allows for flexibility in block placement location. For rib fractures, target the TP that approximately coincides with the area the patient finds most painful. For acute herpes zoster, target the TP just above the rash so the needle does not pass through skin compromised by blisters. Key bony structures (spinous process, TP, and rib) can be differentiated by their shapes and relative depths as the transducer is moved laterally from midline. At the targeted vertebral level, place a high-frequency linear transducer or lower frequency curvilinear probe in cephalocaudal orientation over the midline of the back to identify the vertebral spinous process. (Figure 3A, Figure 3B). Keeping the probe oriented cephalocaudal, slide the probe approximately 3cm laterally towards the side to be blocked, identifying the TP injection target (Figure 3C). To confirm TP identification, slide the probe beyond the target laterally, passing the probe over the costotransverse junction to the rib. The posterior rib adjacent to the costotransverse junction is both lateral and deep to the TP (Figure 3D). By sliding back and forth over the costotransverse junction, the differentiation between the TP and rib will be clear. The TP will be more superficial, blunter, and wider; the rib will be deeper, rounder, and thinner. Figure 3. Transducer positions and associated ultrasound images as the probe moves from medial to lateral. A. Probe positions over the spinous process, TP and rib. Letters and associated dashed lines represent: S = Spinous processes, T = Transverse Processes, R = Ribs. Rounded rectangles = ultrasound transducer footprints (in this example centered on the 5th transverse process and adjacent spinous process and rib). B. Ultrasound image corresponding to the left transducer footprint above, midline over the spinous process. The spinous process is identified as the very superficial hyperechoic structure in the midline of the back creating a hypoechoic acoustic shadow. SP = spinous process. C. Ultrasound image corresponding to the middle transducer footprint above, over the transverse process. The TP is identified as the next most superficial bony vertebral structure (when compared to the spinous process) approximately 3 cm lateral from the spinous process. It resembles a rib, but has several distinguishing features. It appears more blunted, squared off, thicker and wider than the rounded, thin appearance of ribs. Additionally, the pleura deep to the TP is typically difficult to discern, as opposed to the pleura behind the ribs which is highly visible. Another distinguishing feature of the TP is that it abruptly disappears from view with continued lateral sliding of the probe. Ribs, in contrast, stay visible as the probe is moved laterally. Needle shown at target location for injection into the ESP. Trapezius = trapezius muscle. Rhomboid = rhomboid major muscle. Erector spinae = erector spinae muscle. Figure 4 . Insertion site and ultrasound view of the ESPB. A. Insertion site. The transducer is oriented cephalocaudal and held in position over the targeted TP. The needle insertion site is 1–2 cm from the probe, in-line with the ultrasound beam, and either cephalad or caudad to the probe, as the TP can be approached either direction. B. Ultrasound-guided injection into the erector spinae fascial plane. The needle has gently contacted the posterior surface of the TP. Hypoechoic LA is seen lifting the ES muscle away from the TP and spreading across the posterior aspects of adjacent TPs, confirming spread within the ESP. If test injections are seen pooling in the erector spinae muscle instead, make slight adjustments of the needle tip (or rotate the needle so the bevel is facing the TP) until visualizing this planar spread within the ESP. Sc = subcutaneous tissue, Tr = trapezius muscle, Rh = rhomboid muscle, ES = erector spinae muscle, ESP = erector spinae plane, TP = transverse process, triangles = needle, asterisk = needle tip, arrows = LA in the ESP lifting the ES off the TPs.